Great Northern Bean Soup, what’s not to love … and with bacon? White beans simmered and flavored with carrot, celery, onion and Herbs. Add bacon and you’ve got a great dinner for a crisp Fall evening. Cooking the beans in the slow cooker all day makes this an easy fix for dinner. If you have a thing for bacon, the Internet will gladly return about a zillion recipes to use for this popular ingredient. But if you have a thing for the slightly less rock star white bean, there aren’t that many ways to use them. Soup? Oh, or maybe a salad or two. I simply can’t resist buying beans, something about them brings out the comfort in me. And I love picking up white beans, Navy Beans, Great Northern Beans, Cannellini Beans. They’re easy to cook and creamy by nature. For this soup recipe I chose Great Northern Beans. A bit larger than Navy Beans but smaller than Cannellini beans, medium-sized Great Northern beans are known for their mild, nutty flavor and firm flesh. Great in soups and stews, they hold their shape better than Navy beans, take on the flavors of the foods they’re cooked with, and are commonly used in French cassoulets. And speaking of French cassoulets, it’s on my list of things to make. 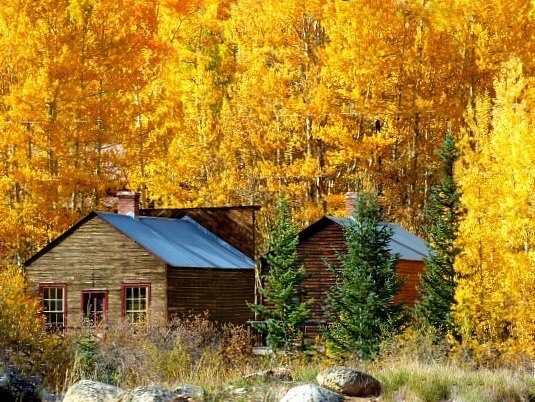 So before we get to this Great Northern Bean Soup, let’s talk about our Fall trip to view the Aspens. This recipe was inspired by a recent trip to the Buena Vista area to take in the color extravaganza show that our Colorado Aspen’s put on each Fall. A side trip found us wandering up a dirt road on our way to St. Elmo, a ghost town in the middle of our Sawatch Mountain Range. Founded in 1880, nearly 2,000 people settled in this town when mining for gold and silver started. Even though St. Elmo is considered a ghost town it is still inhabited. The old mining roads are now used as 4-wheeling trails and Chalk Creek attracts fishing. The town is well preserved, the General Store is open in the Summer months and it’s an easy and scenic drive. And of course, there’s the legend that the ghost of Annabelle Stark lives on with the part-time residents, believing that she continues to protect her property from vandals or trespassers. This is a photo of a cabin inside the town limits. The Fall colors triggered the need for a perfect Fall soup as soon as we arrived back in Highlands Ranch. This fit the bill perfect. I hope you give this Great Northern Bean Soup recipe a try. And if you do, please come back and let me know how you liked it and give the recipe a star rating. Your feedback is valuable to me for developing future recipes. And if you have a favorite Crock Pot Great Northern Bean Soup Recipe, or any white bean soup recipe, let me know, I’d love to give it a try. A soup perfect for a crisp Fall night. Wash beans and pick out any misfits. Place beans in a crock pot and cover with 3 cups of chicken stock. Cook on low for 6-8 hours or until tender. Check crock pot periodically to make sure beans don't go dry. Add more stock if necessary. Stir in the garlic, bay leaf, thyme and rosemary and cook until fragrant, about 2 minutes. Add the beans and any liquid left in the crockpot. Add remaining stock and 3 tablespoons of the reserved bacon fat and bring to a boil. Simmer the soup over low heat until the flavors have married. About 30 minutes. Discard the bay leaf and season the soup with salt and pepper and transfer to shallow bowls. Garnish the soup with the bacon and serve. Wasn’t quite freezing here this morning, but dipped into the high 30’s, so just the idea of soup warmed me up. I am smoking brisket today, so the idea of a hot bowl of soup when I came in from lighting the coals (at 7 AM, 38 degrees) sounds really appealing. I may have to start cooking soups same day I have a long smoking session (a little cold won’t stop the thrill of the grill). Can’t wait to hear about the brisket. Sounds like an all day event? We love soups too! Yours looked excellent! Most of my soups are so full of stuff, they look more like stew sometimes… I think you do the same! Great looking soup and it’s the perfect time of the year. You would cringe when I make soup, I’ve even been known to use an immersion blender for some of my soups. But I’d eat this one just as is. Of course, you can’t go wrong with bacon! I’m surprised it’s not snowing where I am, but I don’t think I’m as high up as you (3500ft). It’s close though! We’re getting a cold, miserable downpour right now – great soup weather! Denver is at 5,280 and Highlands Ranch where I live, 30 miles south, is something like 6800 ft. It’s actually a beautiful day here today. I’m always looking for a good, hearty soup recipe and this looks like the one I’ve been looking for. 🙂 Yum! I love white bean soup – the bacon is an excellent touch. Thanks for the website – I’ll take a look. This looks delish! I love making soup when it cold out, too. I look forward to your soup posts, cause I’m always on the lookout for new recipes :). Keep em coming! Thanks NQN – just wait, I’ll be pulling out the big gun soup recipes soon. All right, here’s my hot kick for when it’s cold…not soup, I’ll leave that to normal people. Throw about 15 ripe tomatillos in boiling water w/ sea salt. They’re done when the first one tries to split open. Then toss them into a processor with serrano peppers (the canned ones actually have the right flavor vs. fresh ones being just plain hot, use a whole small can) and a handful of finely chopped sweet onion and only a smidge of garlic. Secret ingredient, two pinches of white sugar that you don’t tell anyone about. Whir it all up in the processor and grab some chips. Game on. The nice thing is, since the tomas are boiled, it’s a way hot dip. Num. Right when it’s freshly made is best for a cool fall day. uh oh. I think I just party-fouled. I just stuck a recipe on someone else’s food page. Major infraction. That soup looks delicious. The broth sounds perfect – and with bacon, rosemary and thyme . . . mmmm. I’m in California visiting my daughter sans cookbooks, so I may try that recipe this week. She loves a good bean soup. I just got my immersion blender last week because I saw them on sale and have been wanting one forever for some of my soup recipes. It will so beat using the potato masher or worse, straining and pureeing in the food processor. Some recipes just have to be creamy! Tasty post! That looks so hearty! Would be great with some croutons or garlic bread. Thanks for stopping by my blog! Yum…garlic bread would be perfect. On the Great Northern Bean with bacon soup recipe you have in the ingredients: l pound of beans at the beginning of the recipe, then towards the end, you state l cup of dried beans. It never mentions what to do with these latter beans. Am I missing something–obviously, this blog is from years ago, yet no one mentions this disparity. Did I read this wrong? This looks absolutely delicious and I will definitely put it on my list for the coming winter. Thank you so much for your email. I have no idea how that “cup” of beans got into the ingredient list – unless at one point I scaled it down dramatically for a smaller batch. I so appreciate you letting me know. It’s been corrected. Let me know if you make it. Love hearing from readers. I’ll be giving this a try over the weekend… thank you so much for the recipe and for the corrected version. I might go the faster route tough as I have home canned cannellini beans…and a bad cold. I’m sure we’ll love it. You’re so welcome Louise. Let me know how you like it. Your bean soup looks so good! I haven’t made one yet this fall so good to have another great recipe. Love the bacon in this one 🙂 Gorgeous photo of the Aspen trees! Thanks so much Susan. This is one of our very favorites.